Well, I tried yet another new inkle weaving technique today that did not go at all like planned. Will tinker with it more soon... Actually, I had two inkle weaves fail today. Learned something each time, though. I haven't posted in quite a while! This post is in part to nudge myself into posting more. I have a bunch of photos of my own things to post, and hopefully I'll start doing that with more regularity soon. Until then, here are some awesome things I found on the internet! This leatherworker uses curved lines to make leather look like bark - how neat is that idea? I clearly need to look around this person's work more. 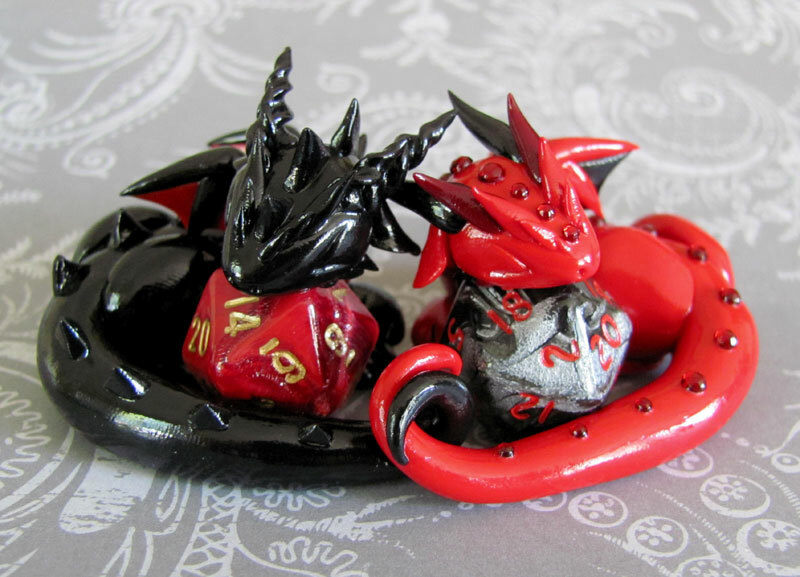 How INSANELY ADORABLE are these dice dragons???? The artist makes these out of a high quality sculpy clay, and does this full time. Looking around the site, I can easily see why. Wow, they are amazing. Now, those of you who have extensively talked about fiber arts with me probably know this already, but I don't actually like to knit very much. I know how (basic knit and purl, at least), but I much prefer to crochet (or sew or embroider or weave or spin or... a lot of other fiber arts). That said, I just ordered a book of knit patterns, because they look that fantastic and unique. They are also designed to be mostly small projects, so hopefully I could finish them before I get too bored! 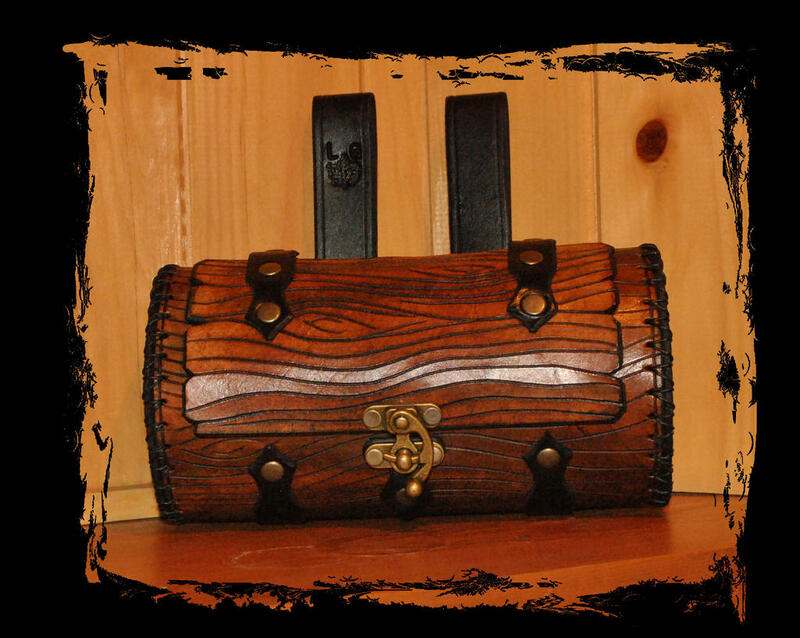 Or just barter with some friends (hey, you make me this, I work leather for you...) to make them make me the projects. Anyway, the author of this book is the author of the blog Tiny Owl Knits, and the book is called Woodland Knits. Yeah, that's a scarf that looks like a birch tree. I may have a nickname that means birch in German, and SCA heraldry with birch trees on it. I may be getting slightly attached to everything surrounding birch trees. You bet that this is one of the pattens I will be looking closely at making. But there's so much more, and I've never seen patterns quite like them. Another leatherworker that I've been following the work of for quite a while is the highly skilled Les Cuirs de Belfeuil, which means something in French. *looks it up* Hey, "cuirs" is "leathers" in French. That makes sense. Anyway, his work is spectacular, and I encourage you to poke around the albums on his Facebook page. He does amazing things with tooling and inlaying of stones and fur. Part of me really wishes I were in France so I could go watch him work and pester him with questions for a couple weeks. It's amazing.